Our Baritainers are one of the most effective ways to store liquids. They come in a jerry-can design that is easy to fill and carry. In many applications, they are able to replace the use of lined steel pails. These containers are extremely functional and attractive. Baritainers are manufactured using advanced technology and materials. They use an overlapping layering process to insure that each Baritainer is ready to safely store liquids. The finished product is attractive and is compatible with many different chemicals. This is the go to product to protect the integrity of the liquid. Vs. Hydrocarbons (solvents) 100 times more efficacious. 2x to 5x improvement in O2 barrier performance. 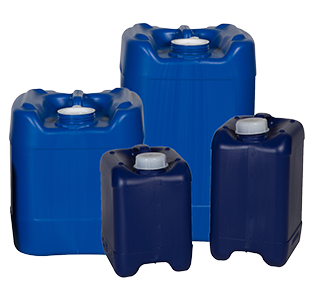 The Baritainer jerry-can is available from National Packaging Services in several different sizes and colors. The size is dependent on the amount and portability requirements of the contents. They are designed withstand impacts and are dent-resistant. One of the best features of the Baritainer jerry-can is their ability to stack. They are designed with a notched bottom. This is great for storing large volumes of liquid. It allows businesses to save that much needed warehouse space. The lightweight properties of this container make it more mobile for transporting from one location to another. National Packaging Services is proud to carry Baritainer. Please contact a sales representative who can answer any question and make suggestions on what products are best for the job. Volume: 4 liter/ 1.1 gal. 5 liter/ 1.3 gal. 13.25 liter/ 3.5 gal. 20 liter / 5.2 gal.